Commercial Digital Waterproof Thermometer DT400 from Comark. 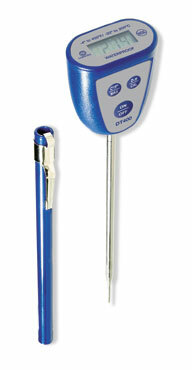 Pocket thermometer is dishwasher safe with thin tip for fast response. Waterproof. Response time better than 6 seconds. -4 to 400F temperature range, 1F accuracy. °F/°C switchable. Maximum temperature hold. Field calibratable. Auto power off. NSF certified. BioCote antimicrobial protection. Can be switched to read in °F or °C and can be calibrated in the field. Besides reading food temperatures, it's waterproof and can check dishwashing temperatures. This model is highly recommended by the California Department of Education Nutrition Division, among other institutions. Thermometer works fine but automatically turns off after 45 minutes. Most dishwashers run a lot longer cycles than 45 minutes so this product does not register the peak sanitizing temperature. This makes this thermometer virtually worthless for its intended purpose. This shut off feature is not mentioned in the product description! This kitchen thermometer is the best I have used. It only takes seconds to register the internal temperature of a roast. The dial is easy to read. I purchased mine at a local restaurant supply, but it was sold out when I went to get one for my daughter-in-law as a gift. I searched the internet until I found this exact model. Ordering and delivery were prompt too.